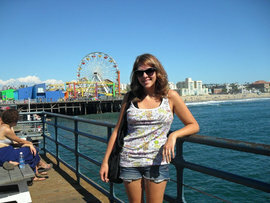 Me at Santa Monica Pier, a very touristy spot. Now, I'm looking for the locals' favorite areas. One of my favorite aspects of spending a semester in America's 2nd largest city is that there's so much to do here, and there are tons of sales and deals to take advantage of. Thanks to LA Weekly, I go on this website daily for awesome deals. It's kind of the same idea as Groupon, except each deal is only available for one day, and there's only one deal available at a time. When most people who haven’t been to LA think of the city, they probably imagine putting their hands in the imprints outside Grauman’s Chinese Theatre or taking pictures next to those pink stars on the Hollywood Walk of Fame. I admit I did all that during my first week here. But now, I almost feel like a local – sitting in traffic and going to iconic areas for work rather than vacation in Hollywood. The LA locals like to hate on the tourists, mainly because big crowds of them walk far too slow across the street after we’ve been trying to turn left for like 3 lights now. Anyway, my point: you can go to those touristy places like the Hollywood & Highland Center, but that’s not seeing the true LA. Don’t get caught up in star-searching. Be a traveler, not a tourist! You have to meet the locals. From talking to my new friends and mentors here plus my own gallivanting around, I’ve put together a new LA bucket list – and no, neither the wax museum nor the Walk of Fame is on it. So, the ICLA media library had the movie ‘Whip It.’ I watched it, and thought, “oh hey, I’m sure LA has a roller derby scene.” Sure enough, they do! I don’t know if they actually punch each other during races, but the pictures look intense either way! Tickets for races are for the 21+ crowd only. However, the LA Derby Dolls do have an all-ages “Baby Doll Brawl” event coming up in a few weeks. A friend who has lived in LA for a few years now raved about this little place she ate at downtown. The restaurant concept is to build our own mac & cheese (with regular or rice noodles, cheese or soy cheese and many veggie/meat add-ins), which is baked to golden perfection. It’s tough finding vegan mac & cheese anywhere, and she told me I can customize my own here?! Count me in. My field producer said I must, must, must go here before I leave LA if I love fashion. After her spiel, there’s no way I’m going back to Ithaca without getting some of those funky, cheap scarves and jewelry she said is everywhere in the district. There’s even a section full of textiles. It’s a private, beautiful beach where Baywatch, Happy Days, Charlie’s Angels, Paris Hilton’s music video and many more were filmed. My field producer let me in on this little secret: parking at Paradise Cove is expensive, but if you buy something at the Paradise Cove Beach Cafe, they validate your parking ticket to a few bucks! I've heard nothing but good things about this vegetarian restaurant from my fellow veggie friends. Restaurant reviews tend to rave about it, too. I could see why - the menu looks fantastic and is full of variety for all of us non-meat eaters. Plus, there's more than one location in the area, which is always a plus. Sadly, this event ended on Halloween. However, it’s important to take note of this annual sale for next year. I went to it and was in complete heaven. The company’s downtown LA factory (where they both make the clothes and have a retail store) sells stuff for super cheap during this sale. I got a pair of skinny jeans for around $20 and a t-shirt for $8. American Apparel fans, you know how expensive that stuff is, so take advantage! There are racks and racks of clothes in every color imaginable. Yum. To quote its website, Toi is “A rock-n-roll ensemble of undeniably delicious Thai food served among a legendary decor inspired by the merciless history of Hollywood's rock bands, movie stars and hit films.” A PA at my internship told me this is a must-see place for its ambiance and good, decently priced food. Plus, there are tables where you can sit on floor cushions instead of chairs. Awesome. Except for the American Apparel sale, I haven’t done the other items on this list! I need to get in the game and start tackling roller derby games and Thai food, pronto. Before I know it, this sweet semester will be coming to and end.